Decorate your life and home with the LiyanQ Fairy String Lights. You know what is the "hotest" in this year? No doubt that is the battery copper wire light. It is really long, 20ft 60 Leds can give you many choice to decor your room, dorm, your vase, Christmas Tree, your garden, your valentine's Day. It is really Wonderful. Outdoor decor is fine, it is waterproof, so no worry, decor your patio is fine. There are many creative ideas of the starry lights for your patio, deck, front porch, room, kitchen, garden. You can turn on/off the lights and change 8 modes by pressing the button on the box. And use the hook on the top of the battery box to hang it on the wall. We offer a remote to make things easy, the CR2025 battery is installed in the remote. You can use it to turn on/off the lights, change modes, adjust brightness and set timer. The copper wire and led bulbs is low heat emission and safe to touch after many hours of usage. 2 remotes included, one remote can control several lights at the same time. 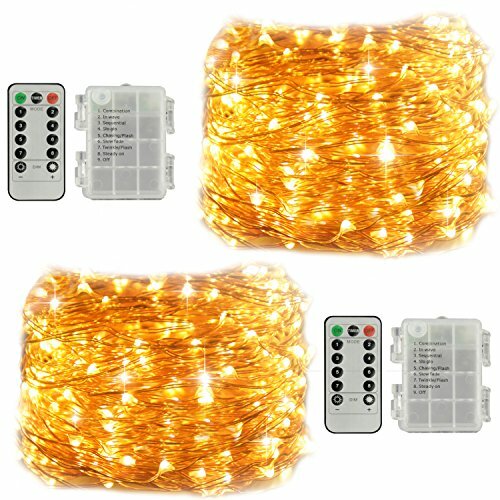 【Fairy String Lights Battery Operated】 You get 2 Sets of battery powered Fairy String Lights, each string light is with 20 feet moldable copper wire and 60 glowing micro Leds; along with 2 remotes to control the lights wirelessly. You can use them to decorate your Xmas Valentine's Day wedding ceremony, party, outdoors indoors. 【High Quality Copper Wire Lights】 LiyanQ copper wire is super thin and flexible and the Copper Wire Lights can be easily bended, and shaped around plants, signs, furniture and almost everything else. Meanwhile with low-heat-emission LED bulbs, the LED string lights will not overheat after using it many hours. You can touch it safely. 【8 Modes Lighting to Create Lots Fun】 The lights have a timer and 8 modes of lighting and flashing available, which are: Combination; In wave; Sequential; Slow glow; Chasing/Flash; Slow fade; Twinkle/Flash; Steady On; 10 levels adjustable brightness and 8 flashing modes create different atmospheres for your life. You can control the mode you want. 【IP65 Waterproof】 The warm white string lights are fully sealed, thus making the copper wire parts submersible, and the battery case is waterproof for outdoor use, feel free to put them into your water fountain to create amazing water scene. 【Fairy Lights Remote Control】 Easily turn on/off the lights with the cute remote; set them in timer to auto on and off each day; adjust the brightness; switch from flash to twinkle to slow fade to steady on etc. ALL IS IN YOUR CONTROL! Fresh AA battery(not included) can last for up to 5 days with continuously STEADY ON Lighting, let along on flashing mode; with timer set for 6 hours on each day, they will last for more than half a month without problem. If you have any questions about this product by LiyuanQ, contact us by completing and submitting the form below. If you are looking for a specif part number, please include it with your message.